The Pilots scored two runs in the first inning, and used excellent pitching to hang on for a 3-1 victory at Oregon. Ducks only run was a ninth inning home run. Overall record is now 31-9, with 15 games to go. The freshman pitched 7 innings, pitched a shutout, and gave up only 4 hits. Great job! 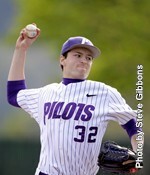 Johnson was a stud... great W for the Pilots... let's carry the momentum into this weekend vs. USD! The "O" more likely will point out that we've only beaten them 4 times since 1981. 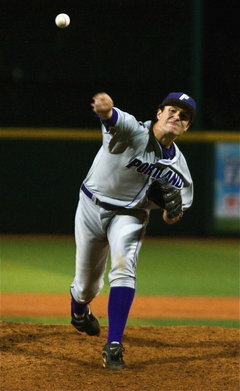 University of Portland pitcher Chris Johnson pitched seven nearly perfect innings during the game between the University of Oregon Ducks and Pilots. EUGENE -- A year ago about this time Chris Johnson was an impatient high school kid, squirming in a dugout in Washington wondering if the stress fracture in his back would ever heal fast enough to get him back on the mound. On Tuesday night, Johnson was the king of everything he saw. The University of Portland rookie pitched seven near-flawless innings as the Pilots stunned 15th-ranked Oregon 3-1 at PK Park. Johnson scattered just four hits in seven shutout innings, walked one and struck out five as the upstart Pilots ran their record to 31-9 and set up the big three-game West Coast Conference series against San Diego at Pilot Stadium this weekend. Portland coach Chris Sperry was as impressed as everybody else at what the 6-foot-4, 195-pound rookie did to the Ducks. "He certainly hasn't pitched like a freshman lately," he said. "He has been pitching like an adult." When he pitched at all. Tuesday night was Johnson's 12th appearance of the year, but he only had 19 innings in 39 games coming into his big showdown. The Pilots are deep in the bullpen this season, and it's hard to get a start. "I could locate all my pitches tonight," said Johnson, who did his high school work at Meadowdale High School in Edmonds, Wash. "(Catcher Rocky Gale) called a great game tonight. He mainly had me throwing sliders. "This feels really good. It's pretty special for us to come down here and beat a good team like Oregon." The back issue kept Johnson out of baseball from midway through his senior season to the day he showed up at UP for his first year of school. "It was a stress fracture," he said. "It kept me out of summer ball and half of my senior year, so I was really glad to get to fall workouts." Oregon opened with sophomore right-hander Joey Housey, who came into the game with a 0.96 earned run average. The Pilots were singularly unimpressed and hammered Housey right out of the chute. Leadoff hitter Kris Kauppila smashed a single to right field, then Housey lost one inside to Craig Smith and hit the UP center fielder on the arm. Housey settled to get an infield out that moved the two runners up, then Beau Fraser pit Duck left fielder Marcus Piazzisi up against the wall for a sacrifice fly that scored Kauppila. Right fielder Kyle Haskin launched a rocket up the middle for a single that scored Smith, and the Pilots were in command. After a wobbly first inning, Johnson kept them there. Oregon got runners on second and third on Piazzisi's bunt single and Eddie Rodriguez's double yanked down the third base line past a diving Matt Mardesich. That rally died when Johnson induced a routine ground out to end the inning, then the big right-hander settled into a comfortable rhythm. He got the Ducks in order in the second and third, allowed a two-out double to Steven Packard in the fourth, walked a batter in the fifth and allowed a cheap single to Rodriguez in the sixth. Oregon brought Madison Boer in after two innings, and the right-hander retired the next 13 Portland batters he faced. The Pilots got another run in the top of the seventh when Garrett Queen topped a swinging bunt to the left side and Boer threw it into right field to put him on second. That mattered a lot when catcher Rocky Gale followed with a single up the middle to put UP up 3-0. Johnson retired the Ducks in order in his seventh and last inning and yielded to left-hander Ed Wakefield. Wakefield got an out and walked KC Serna, and in came the Pilots' door-slammer, Chris Dennis. Dennis allowed a one-out home run to Rodriguez in the ninth, then got his 13th save of the season. Note: Oregon senior right-hander Justin LaTempa on Tuesday was named the National Collegiate Baseball Writers Association's national pitcher of the week after throwing a one-hitter in Saturday's 6-0 Pacific-10 Conference victory over Washington State at PK Park in Eugene. Ducks have been getting their butts kicked by the Pilots all year! Congratulations to the baseball team! The Eugene Register-Guard has a good story in their on-line sports section with excellent quotes from the Oregon coach. I hope "flies" wasn't supposed to be cute here. There was a beautiful moment on 95.5 The Game this morning... just before 9. I'll see if I can get the mp3 of it. Anyway, so Dwight Jaynes hosts their morning drive-time show and also did the color commentary for the UP/UO game last night. Some caller called in and started rambling on about how great the Ducks baseball team is and specifically mentioned a play the Ducks' second baseman made, yadda yadda yadda, when Jaynes finally said, "Yes, it was a great play, but let's all give props to the Portland Pilots, who, remember, actually beat the Ducks last night." The University of Portland stretched its winning streak to 11 games with a 3-1 win at No. 19 Oregon on Tuesday night behind the stellar pitching efforts of freshman right-hander Chris Johnson and junior closer Chris Dennis. Johnson threw seven scoreless innings, scattering five hits and striking out five batters as he improved to 3-1 on the year with a 1.38 ERA. Dennis picked up his 13th save of the season, and is now tied for the national lead, despite giving up a solo homer to Eddie Rodriguez in the ninth inning. With 11 straight victories, Portland (31-9) matched the second longest winning streak in program history which was set in 1980. The school record of 14 consecutive wins was set in 1958. The Pilots host San Diego in a pivotal West Coast Conference series beginning May 7 between the top two teams in the league standings. Stonehouse wrote: There was a beautiful moment on 95.5 The Game this morning... just before 9. I'll see if I can get the mp3 of it. Sometimes your own family is the harshest critic. Yeah coach - either that or your guys can't hit low sliders. The coach went on to say that Johnson kept them off balance. if throwing 85% sliders does that, it's time to reevaluate your hitting lessons.